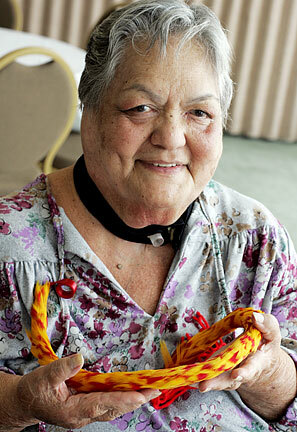 Aunty Ethelreda Kahalewai shows a lei of dyed goose feathers that she made at the Makaha Resort. "ENJOY LIFE and eat dessert first" is Aunty Ethelreda Kahalewai's mantra. It reflects this master crafter's ebullient attitude -- as well as her art form of feather work: vibrant, gently soft and light in texture and spirit. Faced with many challenges -- from the loss of her husband to an illness that left her in a wheelchair -- Kahalewai still maintains that positive attitude. It is as though she has no time for negatives. "The door swings both ways. If you don't like something, you can always walk out the door." This weekend, Kahalewai, a longtime member of Ewa Pu'uloa Hawaiian Civic Club, is among honorees at the annual Holoku Ball, acknowledged for her contributions to the native arts. Other honorees are kumu hula John Keolamaka'a-inanakala-huiokalanino Kamehameha'ekolu Lake, for his work enriching the community through education and cultural preservation, and Mary Smith for her dedication to the Hawaiian Civic Club of Honolulu. Kahalewai is making feather leis for the two other honorees. "The leftover feathers will be used to make my own lei," she said. "They should have the beginning and I have the end." THE FIRST Holoku Ball was held nearly 80 years ago as a scholarship fundraiser. It continues to provide financial assistance for Hawaiians to pursue college degrees. "We should all give back to the community," Kahalewai said. "No matter what we are doing, we had to get inspiration from somebody." Kahalewai herself became more involved in community and cultural activities after her husband's death, and this led to her becoming a haku hulu, a master of traditional Hawaiian feather work. A requirement of one of her club's was to participate in a feather-work class. "I really didn't want to go," she said. But that is where she met her teacher, Mary Lou Kekuewa, in 1974. "I was hooked on it," she said. Aunty Ethelreda Kahalewai demonstrates her feather lei making technique. The hobby led to her opening a feather shop, the Royal Feather Co. in Aiea, in 1985. She taught, as well, including 10 years of classes at the Oahu Community Correctional Center. The Kamehameha Schools, Kauai Museum, Baldwin Museum in Alaska and various cultural festivals are among the other venues where she has shared her feather lei-making skills. Her shop closed in 1996 when she began to experience health problems, but she still teaches and, of course, makes her leis. "It's so relaxing that I don't even answer the phone when making leis," she said. That positive attitude remains essential. "I need to do this when I'm in a good mood. If I think bad thoughts, I need to take the whole thing apart. It comes out ugly at the beginning or in the middle ... never where you are working." An average lei takes between 12 and 14 hours to complete, with the most time-consuming task involving cutting the feathers. "I stopped counting the hours," she said. Kahalewai also washes all of the feathers before using them. "Washing the feathers gets rid of any excess dye. The feathers have more shine if the dirt and dust are rinsed off them." Once students learn the basics, she said, they can improvise and find their own personal style. 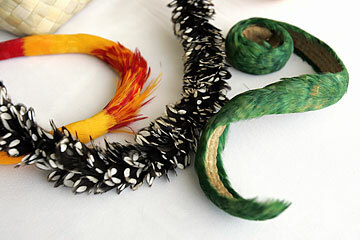 The green lei is strung from dyed duck feathers, the orange, from dyed goose feathers and the black from feathers of the Francolin bird. Now that the feather shop is closed and she has retired from her job at the Department of Health, Kahalewai had hoped to become a "lady of leisure." She chuckled, "Famous last words." Instead, along with teaching, she regularly involves herself in community activities, including refurbishing the kahili at Princess Pauahi's home, Haleakala, on the Kamehameha Schools campus. The kahili are replicas of those made by Queen Liliuokalani for Princess Pauahi. 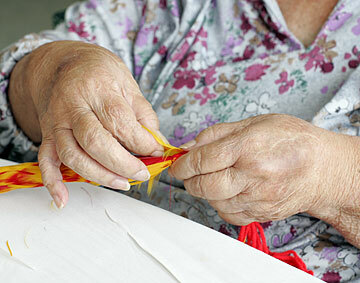 In her spare time, she works on lau hala projects and quilts. Seventy-three year old Kahalewai is a mother of six children and has 19 grandchildren and 19 great-grandchildren. Her grandmother also created feather leis. "I'm still trying to replicate her stitches. Maybe one day." Although many would consider her leis works of art, Kahalewai wants them to be handled. "I want them to be used and enjoyed, not just kept in a box."